Caroline’s background as a jockey and her collaboration with Monty Roberts and many other professional horse people over the years gives her unique equine experience that she would like to share with you. No previous experience is necessary to attend this ‘taster’. It can teach you a lot about yourself and how you communicate with others. The horse does not care who you are – he just reads you! Learning to interact with such a wonderful animal with just the use of your voice and body language can be a rewarding experience! Horses, like people, have personalities and they are all different. You will get your horse to follow you through a variety of obstacles through trust and body language. You will learn to understand the way your horse thinks and also learn more about yourself in the process! As your relationship with your horse progresses, you will learn how to control him on long reins. You will learn the importance of verbal communication and body language, building trust. Training your horse is essential for a well-mannered partner and will also improve his response to you when under saddle and in difficult situations. Participants will have to have attended at least two of the above or a previous session to be able to attend. The skills you have learnt on previous sessions will be assessed. 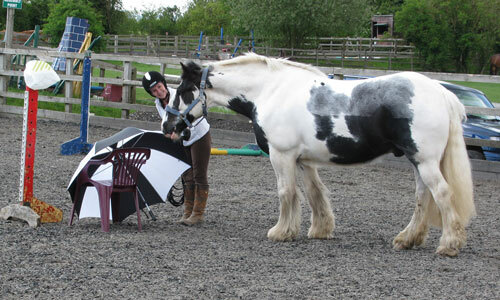 You will also learn how to lead and load a horse into a trailer, a task that can often be a real problem for some! We all know that challenges alter our lives. When faced holistically, they teach us something new about ourselves. They raise our self-esteem, strengthen our self-belief and confirm our values. To change we need to trust in ourselves. Challenges are an all important part of the process of change. How we change and how those experiences affect us, allow us to re-evaluate ourselves and become more aware. The horse has been our partner for thousands of years. Life for today’s horse has changed too. We question how this change has affected our relationship and ability to communicate with the horse. How we need to change to reap all that the horse has to offer us, both as a life enhancing challenge and as a unique and continuously growing and mutually respectful partnership. 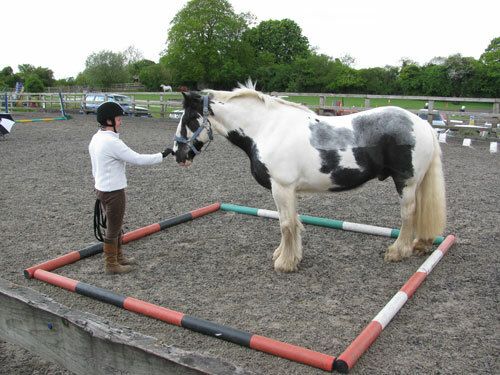 By exploring ways the horse can be trained we also evaluate the communication process. We learn from that connection, we become more understanding, receptive and open to change. We enable and support the horse to triumph through exemplary ground handling – good communication, empathy and precise timing – building trust and love. Interesting how horses react in different situations! 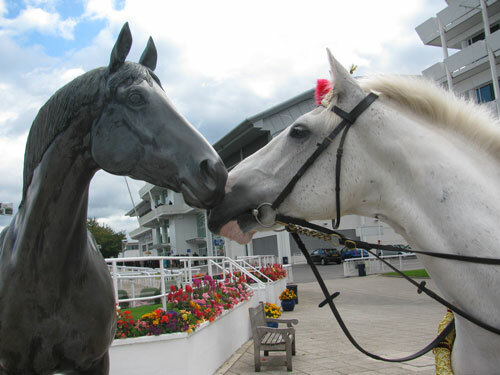 Here is Blue meeting the statue of the Derby winner “Generous” at Epsom Racecourse! He couldn’t work out if it was real or not! By the way, on this occasion he was dressed up for an Indian wedding!